Hydraulic scrap baling presses find applications in making required bale of any metal scrap, paper scrap, cotton bale, jute bale and plastic scrap. 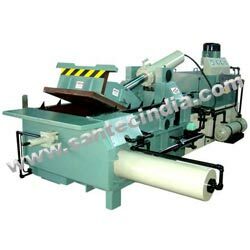 The capacity of these presses includes different tonnage specifications as per the with two chambers for fast production. Moreover, these presses have either manual hand lever operated arrangement or push button operated - automatic / PLC (programmable) control. Depending upon materials or the requirements, the scrap bailing presses can shape scrapes into round shape, rectangular shape, square shape, cylindrical shape and other shapes, as desired. The scrapes are simply rolled up inside the baler using rubberized belts, fixed rollers or a combination of rollers and belts. When the bale reaches a determined size, appropriate binding or wrapping can be achieved. The back of the baler is opened up and the bale is discharged. Balers typically produce bales in different diameters. The bales weigh from 500 to 600 kg, depending upon size, material and dampness. Balers have curved box design and larger loading chamber that efficiently process bulky loose scrap and gauge material down to manageable dimension and wide variable length bundles. The operator controls the 3-way compression process from the operator cab. Final compression is fully automatic. Increased hydraulic power allows the operator to sort and stack material during the automatic baling cycle eliminating lost labor time and minimizing the labor cost per ton. Hydraulic balers are solidly-built to withstand the demands of the job. These machines prove that there is no substitute for them.